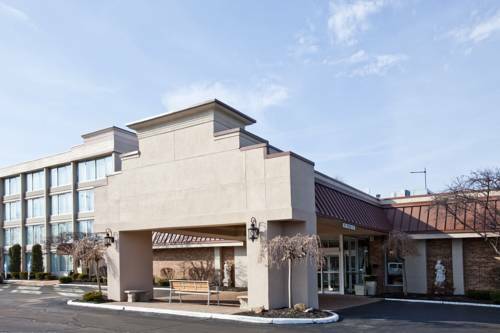 Relax at Hotel's Location near Cleveland, OhioOnce you arrive at the Holiday Inn Cleveland - Mayfield, Ohio hotel, you'll be greeted by a glowing fireplace and deep cherry tones of the intricately designed bookcases. Conveniently located, this hotel near Cleveland, Ohio is nestled among the big city's tree-laden suburbs with quick access to I-480 and I-90.Cleveland is host to the corporate headquarters of more than 25 Fortune 500 companies, and Philips Medical Systems, Progressive, Parker Hannifin and Rockwell Automation are all within five miles of this property. Business travelers staying in our executive rooms also have exclusive access to the Executive Lounge furnished with plush couches, a conference table and a 42-inch LCD TV.This hotel skirts downtown Cleveland, Ohio by only 15 miles, and other area attractions, like the Rock and Roll Hall of Fame, are even closer. John Carroll, Case Western and Ursuline College are within a 10-mile radius, as well, which is ideal for prospective students and their families.As a two-time Torchbearer Award winning hotel that has been family-owned and operated for 40 years, the Holiday Inn Cleveland - Mayfield, Ohio hotel consistently exceeds traveler's expectations. You can unwind in the indoor or outdoor pools and sauna and dine on the patio after hosting an event in the ballroom or chatting with family at home via free Wi-Fi access. We provide everything you need for a great stay! Alfredo's at the Inn: Friendly, warm atmosphere, with a great selection of wines and beers to suit anyone's taste! Stonewater Golf ClubAward winning Hurdzan/Fry Design. Hurdzan and Fry aim to "Stir the Spirit" with their designs. Our management staff aims to do the same with the golf experience we bring to the golfer. Come out and join us for a round today at Stonewater Golf Club!